The original location of the temporary loop between Jersey City in the background and Bethlehem in the lower left. 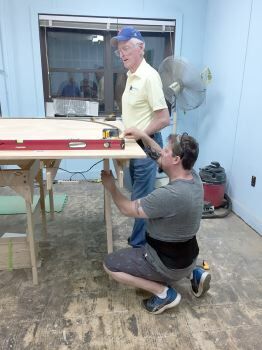 Cleaning up the new benchwork at the west end of Bethlehem to receive the loop. The temporary loop can be seen in the far right hand corner of the picture. 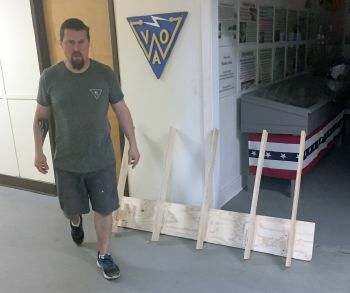 Mike moves the extra roadbed from Bethlehem to the storage area so we can use it at a later time. 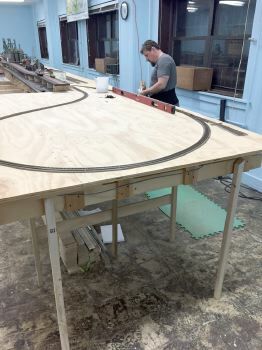 The loop was unscrewed from its original benchwork and moved into the hall to give us a little more room to work on it. 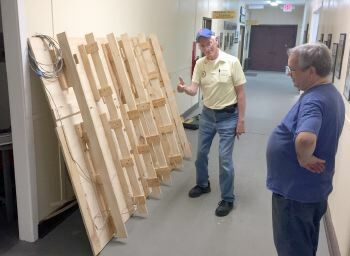 Bob and Martin lean the loop against the wall. 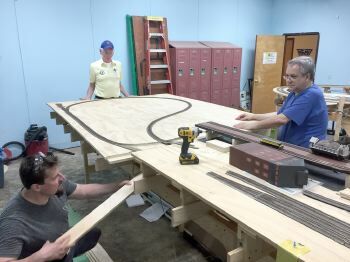 The box frames connecting Jersey City to Bethlehem with the loop removed. 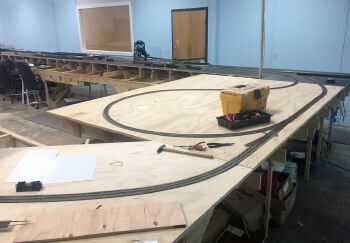 The view from the center of the layout room of where the loop *was*. The west end of Bethlehem where the loop will be relocated. 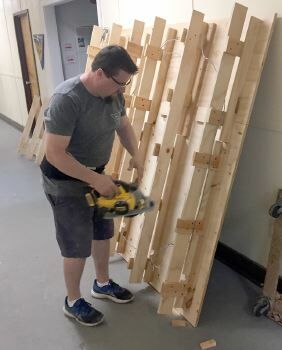 Mike trims off the excess wood from the risers on the temporary loop in the hallway. 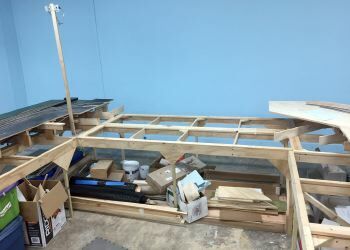 Its a lot easier to work on it on its side in the hall than when it was still attached to the box frames. 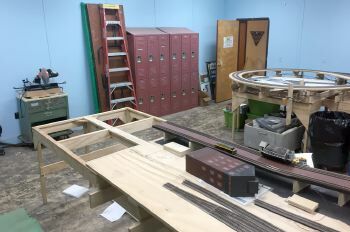 The loop sitting in place in its new location. 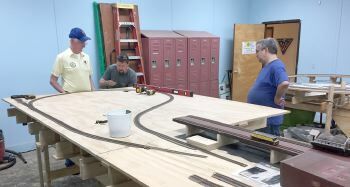 It was relatively easy for the four of us to move it into the hall, then back into the layout room. Using the dolly did help though. 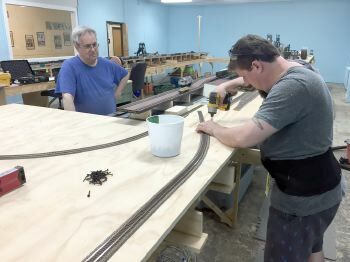 Mike shims up the loop to bring it to the height of the existing Bethlehem track while Bob and Martin steady it. 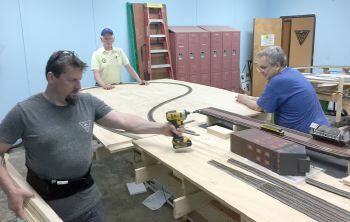 Securing the loop to the Bethlehem benchwork. 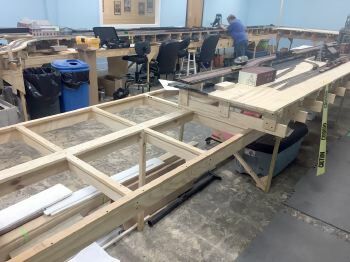 Legs are added to the frame to support the last two feet of the loop that extends into the aisle way past the existing box frame. The loop gets leveled. Again. 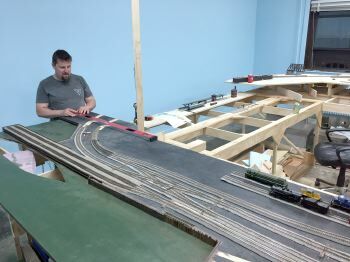 Now back to the other end of the layout. 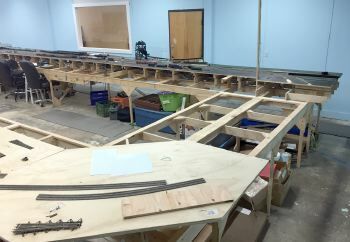 The Jersey City end of the benchwork gets cleaned up so we can add the new Easton track supports. 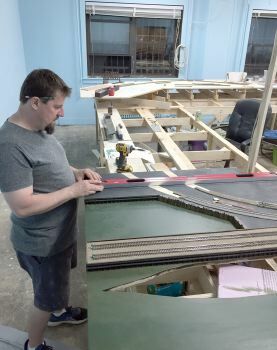 Mike is making a clean edge.